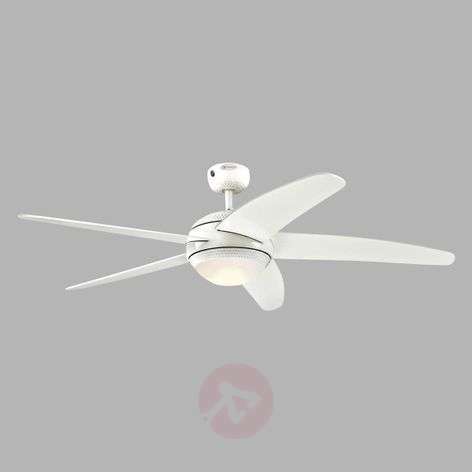 The Bendan LED ceiling fan has a modern and simple design with a chrome-plated body and white wooden blades. The built-in LED light provides general lighting. The light can also be dimmed via the remote control provided. The AA batteries for the remote control are not included. The Bendan LED ceiling fan was designed to refresh the air in rooms with a size of up to 36 m². An air flow of 159 m³ per minute is generated. Comes with summer and winter modes so that you can change the direction of the ceiling fan to switch between cooling the air and evenly redistributing the warm air. The LED light can be dimmed via the remote control. An extension rod is included. This must be used on installation.